My personal food philosophy is that it has to be healthful, flavorful, and no more complicated than is necessary. I genuinely enjoy cooking for my family; it’s not a task to me. That doesn’t mean I’m not busy and I don’t have to find ways to save myself time, but I’ve made the type and quality of food we eat a priority, so that means I cut corners in other ways. 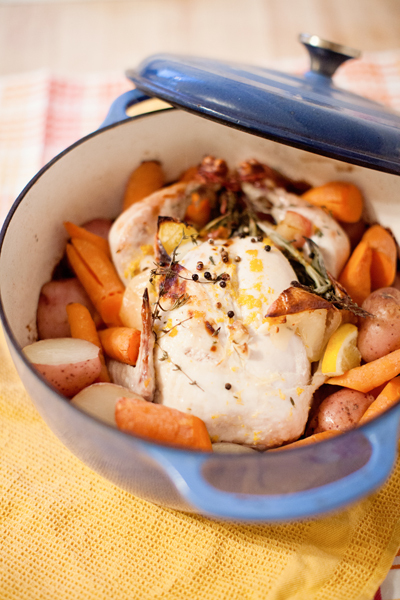 The Dutch Oven roasted chicken is my “microwave dinner,” if you will. 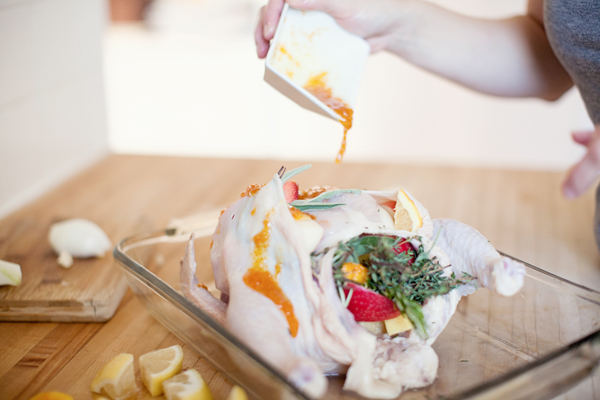 I can give up less than two hours (often on a weekend) to roasting this bird and have more than just one meal. So when I pay a hefty price for the free-range, feel-good chicken I’m getting my money’s worth for sure. It’s not just any dried out, salt and pepper roasted chicken though. This thing is singing with flavor with plenty of juices to make you forget that whole white meat vs. dark meat debate. And forget asking for seconds. No one can have them because I’m making a second dinner with this chicken. The trick is to all that flavor and juice is to stuff this chicken full of flavor agents, things that offer plenty of good flavor without jamming it up with salts and fats. 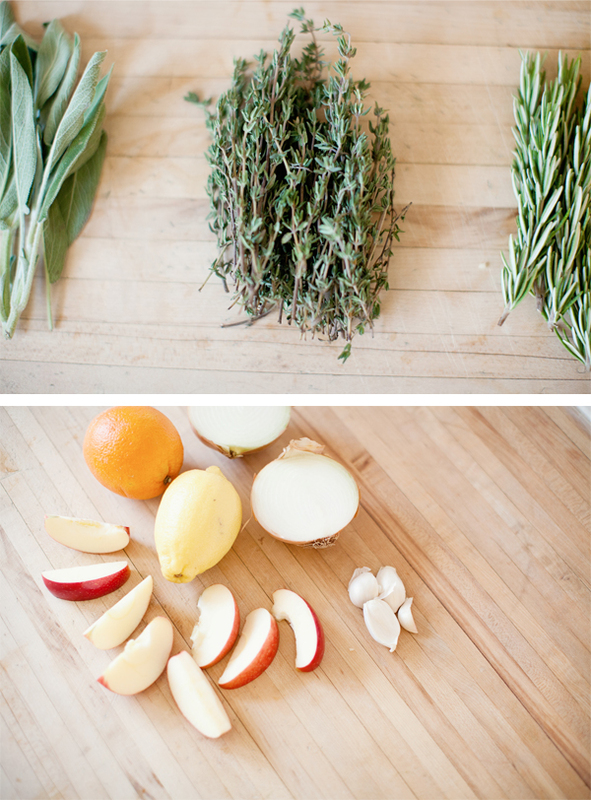 Fresh herbs, oranges, apples, garlic, onions, and whole peppercorns are my go-to flavor agents. These give the chicken a subtle flavor that makes it delicious enough to eat on its own, or save to use in other meals throughout the week. I add more flavor by coating the skin in a mixture of orange zest, olive oil, and honey, rubbing it under the skin as well as across the top. 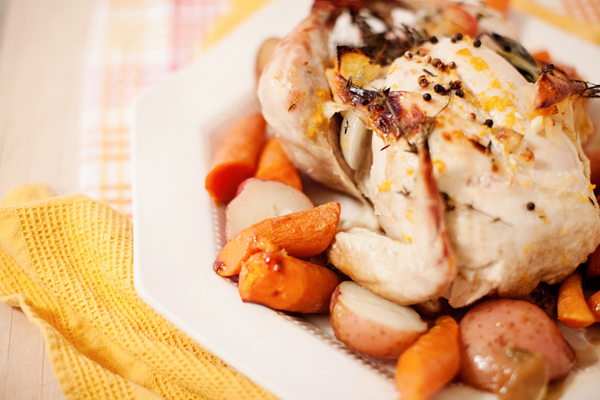 The fruit, herbs, and other ingredients are stuffed inside the chicken as well as under the skin on the outside. This gives every piece of meat a chance to infuse with all of those warm, sweet flavors. I like to use a cast iron Dutch Oven to roast my chicken. It takes one hour. ONE! HOUR! In the world of roasting chickens, that’s nothing, especially when you consider how much time it takes in a Crock Pot. Plus, you get the added bonus of crispy edges and perfectly roasted veggies, too. 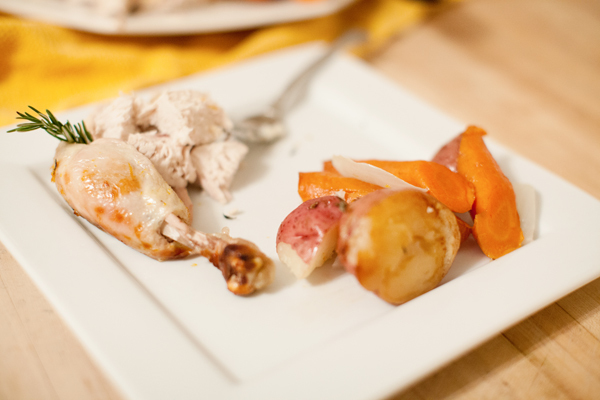 Carrots and red potatoes always adorn my roasted chicken; they come out so tender, and a little crisp and chewy. That’s first meal; the night I prepare the chicken and vegetables, that’s what we have for dinner. It’s a classic meat and potatoes meal; comfort food that I’m comfortable serving. 1. Zest the orange and combine with honey and olive oil. Set aside. 2. Heat a Dutch Oven on the stove top at medium-high heat, and preheat the oven to 450 degrees F.
3. Stuff the chicken with slices or chunks of the apple, lemon, orange, herbs, garlic, and onion, putting some inside the cavity of the chicken as well as under the skin on the outside. Tie the legs closed with twine. 4. Pour the orange mixture over the chicken rubbing under the skin and all around the outside. 5. Add a drizzle of olive oil and some of the onion and garlic to the Dutch Oven. Then, place the chicken inside to sear. 6. Add the chopped potatoes and carrots, extra herbs, apples, and onions all around the outside of the chicken. Place the lid on the Dutch Oven and put in the oven to cook for about one hour. Chicken, Pear, and Arugula Stuffed Pitas. 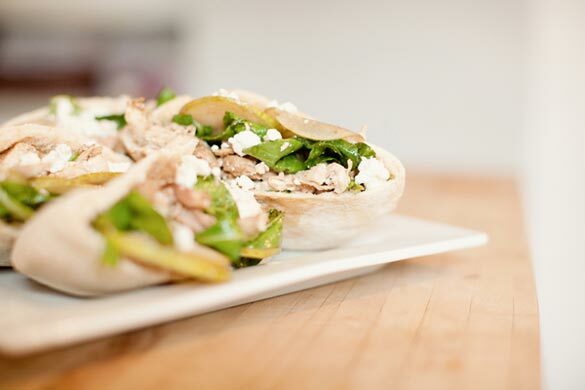 Our featured recipe at Fit Bottomed Eats, we stuff warm pitas with roasted chicken, thin slices of juicy pears, peppery arugula, and crumbly feta cheese. It’s seriously a ten-minute dinner that’s great for grab-and-go nights. 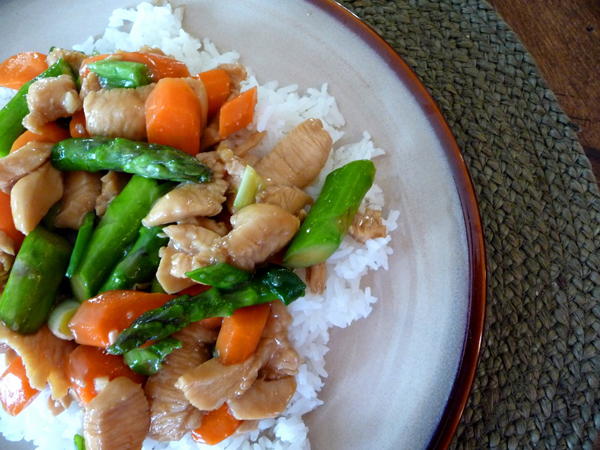 Chicken and Asparagus Stir Fry in Honey Ginger Sauce. 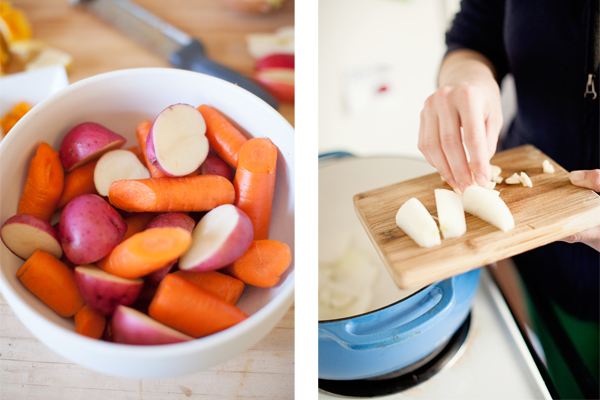 I swap the sherry and broth for red wine and use fresh garlic in place of dried. I also add thin slivers of red bell pepper. You can’t ever have too many veggies! Lighter Chicken Caesar Salad. 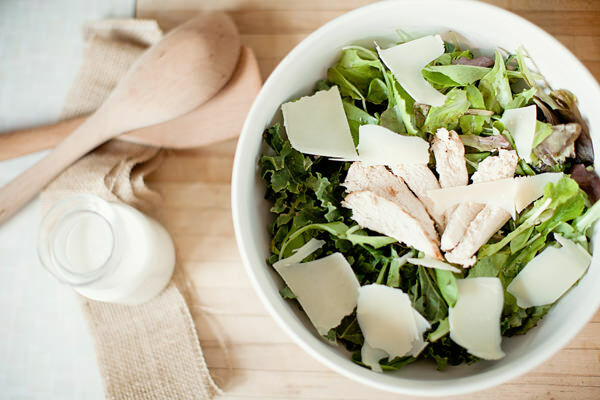 Toss the roasted chicken with your choice of greens, fresh Parmesan cheese, and our homemade Caesar dressing made with Greek yogurt and feta cheese. Plus, we grill our own croutons to toss on top! Creamy Parmesan White Wine Sauce with Pasta. 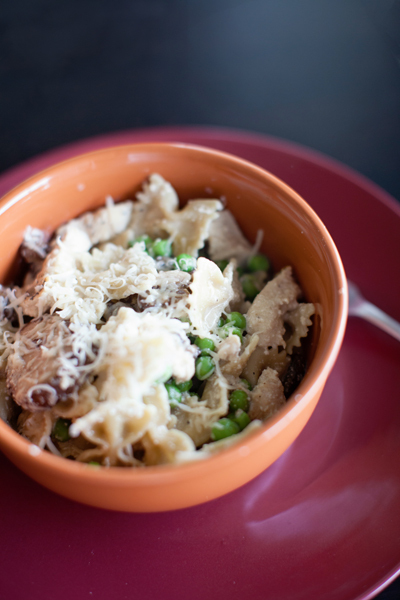 This take on Alfredo sauce is to die for, and it’s only 419 calories for the entire dish. Ever look at Alfredo sauce? This is a steal! Use your roasted chicken instead of cooking again and dinner is ready in the time it takes to boil the pasta.